I’m going to level with you. I’m not a big fan of driving processes with Email. Oh sure, Email does have its place. When I order a new gadget on Amazon, I like to get that Email confirmation. And it’s cool to track your order via FedEx as it makes its way to your door. But Email is overused as a means of alerting and for triggering activity. When designing or automating a new process, I am often asked whether I can send an Email every time a “widget” is ordered or every time a “request” is processed. In general, this works well with external customers, who are receiving infrequent emails. But I generally try to steer my clients away from Email alerts within their operations. And this is simply because of the volume. When operations people are receiving dozens of automatically generated Emails a day, it swamps their inboxes. An inbox is a terrible “todo” list. You tend to forget (no matter how disciplined you are) which orders have been processed and which haven’t. And if those Emails have been sent to multiple people (which is often the case with robo-mail) the problem is magnified. “Hey Bill! Did you process the order from Acme Diagnostics?” I can already hear my clients shouting at each other across the lab. Instead of emails, we recommend using Action Graphs. We design these graphs to be real-time, intuitive, and actionable. Real time means they are always current. Intuitive means they are easy to understand and relevant to the business. And actionable means you can click on them to take you to the underlying data that needs attention. 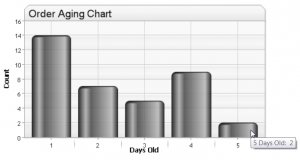 Below is an example of an Action Graph we might design for a client’s operations. The X-Axis shows how many days it’s been since open orders have been placed. The Y-Axis tells us how many orders from that day still need attention. By mousing over a bar, underlying aggregate data can be revealed. And by clicking on a bar, it will take you to the underlying data. Typically, the orders that have been open the longest would be a high priority. We find these Action Graphs spur self-correcting behavior. Some clients will purchase a large monitor and place Action Graphs in full view so they act as a digital whiteboard. 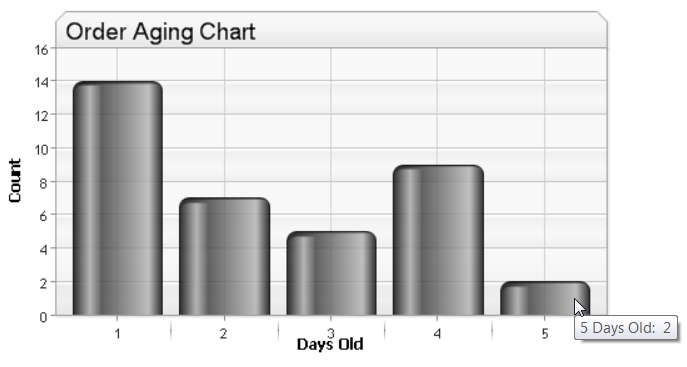 And touch screen technology makes it practical to turn these Graphs into real-time status charts. Imagine the possibilities! Another technique is to compile a daily or weekly “rollup email” that aggregates all the activity over a given timeframe. The BioIT platform has a built in scheduler suitable for launching background jobs. We compile stylized HTML reports (like Constant Contact) and Adobe PDF reports that can be mailed to key stakeholders. This cuts down on inbox clutter, and ensures notification even when it’s impractical to log into the system. There are many ways to communicate information to your clients and email is certainly one useful tool. But try not to spam your customers. The Myth of the Waterfall Clinical Diagnostics: An Internet Business?